Today, almost one third of children under five, suffer from stunting and three-quarter do suffer from anaemia. A quarter of women of childbearing age are overweight or obese and nearly two adults in five do suffer from high blood pressure. Children suffering from stunting do experience cognitive delay which affects in a negative way their academic performances and has a long-lasting effect on their work capabilities and revenues once they become adults. These children also grow with a higher risk of becoming obese and to suffer from certain chronic diseases which prevalence are on the rise in our country. All this has a considerable effect on the human capital development and threatens to permanently jeopardize our economic and social development goals. It is therefore essential, for health and ethical and political and social as well as econpmic reasons to tackle malnutrition in all its forms with a particular emphasis on the vulnerable ones. 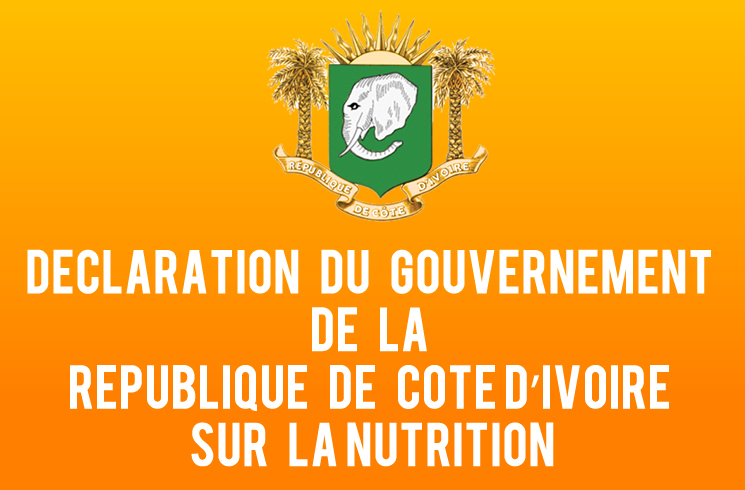 To consolidate what has been achieved and strengthen the action against malnutrition, the state of Côte d’Ivoire has, acknowledging that malnutrition causes are complex and multifactorial and that efficient actions necessitate from all involved parties, a convergence and synergy of the efforts, established in July 2014, the National Nutrition Committee, chaired by the Prime Minister. This Committee provides a coordinating platform of all undertaken actions at all levels for a more effective management and more efficient programming of the nutrition interventions. The new nutrition policy dictates the orientation for a coordinated answer of the different sectors to improve in a sustainable manner the nutritional status of the population and foster economic growth and a more inclusive development. With this National Nutrition Policy, the Government of Côte d’Ivoire reiterates that nutrition is a national priority.